I was so intrigued with the movie, Casablanca that I saw it four times in my younger days. So recently when I was enroute to Casablanca, Morocco, I was thrilled when our tour director announced that he was going to show the famous movie on the coach. 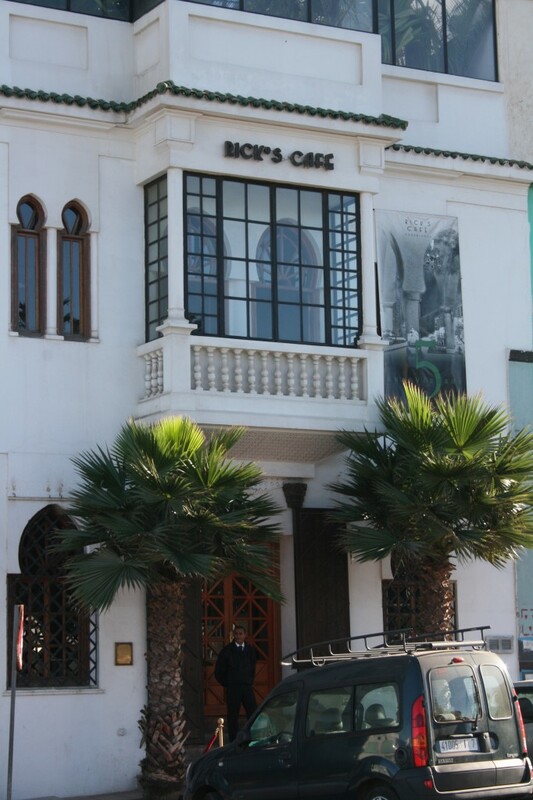 When in Casablanca, tourists must visit Rick’s Café, which is the famous café in the movie Casablanca, starring Humphrey Bogart, Ingrid Bergman and Paul Henreid. As you walk into the dimly-lit restaurant, it is not a far fetched thought to imagine Ingrid Bergman and Humphrey Bogart having a drink together at the next table. The creator of Rick’s Café, Kathy Kriger who opened the restaurant in 2004, tastefully creating the film’s environment with the piano bar, balconies, brass lighting etc. Rick’s Café has become a world-class restaurant luring visitors to Casablanca to experience a unique evening of music and good food. Morocco has always been a crossroads between Africa, Europe and the Middle East. We entered by ferry from Tangier, which was controlled for more than half of the 20th century by western powers. It has a cosmopolitan population and a vibrant nightlife. When we entered Tangier, our tour director informed me that on previous tours a journalist was interrogated heavily because he had clearly declared his profession in the entry form provided at the border. He advised me to mention something else as my profession. Following his advice, I wrote chef as my profession though except for making a boiled egg, I am lost in the kitchen. When my turn came to see the immigration officer, I greeted him in Arabic “Asalam alaikume.” He was pleased with my Arabic salutation and delighted to note that I was born in Zanzibar, Tanzania, which used to be an Arab sultanate. However, a Malaysian woman in our group was not so lucky as she was told she needed a visa to enter Morocco. Now when she left her country, she was told Malaysians did not need a visa. So all 45 of us were delayed because of her. A senior immigration officer was summoned to deal with her case. After some negotiations and help from our Arab-speaking guide, the matter was resolved. The woman was asked to pay 430 dirhams (the Moroccan currency). Out of this, 120 dirhams were the penalty for not having the visa and the rest was for “lubrication services” – or whatever you want to call it. “I am the only one from a Muslim country,” the Malaysian woman said, “ and this is the way a citizen from a Muslim nation is being treated by a Muslim country. Where is Muslim camaraderie?” she asked. She didn’t know if Malaysia had any diplomatic problems with Morocco. The first thing one should do after one gets the visa at the border is to change one’s dollars to local currency. There are about three banks near the ferry where one can exchange one’s currency unless you are Australians. For some reason, Morocco doesn’t like Australian currency. So if you’re an Australian traveling to Morocco, beware: take American or Canadian dollars, British pounds or Euros but not Australian dollars. They will not touch it. Naguib, our tourist guide in Morocco, proudly typified the Morocco national ethic. Every Moroccan outwardly is a staunch believer in God, country and king. Though Moroccans have had tumultuous political domestic history with restricted political powers allowed by their kings, monarchy appears to be outwardly revered by the people. From Marrakesh to Casablanca, one outwardly hears nothing but praise of King Hassan II (1929-1999) and his successor King Mohamed VI and the developments that they have made in the country for the benefit of the people. Morocco is no democracy. Mohammed is Morocco’s absolute authoritative ruler, more interested in power than governance, though throughout the country, there are plenty of housing projects under construction. The country has an excellent network of roadway system making transportation between major cities easy and boosting tourism and industry. Buses and coach loads full of tourists are to be seen everywhere. Friendly people, good food, excellent weather and warm welcome await tourists from all over the world in Morocco. Having undergone occupation mainly under Spain and France, Moroccans are used to foreigners and hence speak several languages fluently. One can find five-star to budget hotels to suit every pocket. Morocco is well worth a visit.